I love Tinkerbell...she is classic Disneyland...not quite a princess...but every bit worthy of flying around the castle! She is spunky and had her sights set on Peter Pan...you can't help but love her! no these are not contacts...(never worn contacts a day in my life...) but I did have fun in photoshop playing around...ha ha ha....Tink had blue eyes you know! that was a great video! thanks for making it... shading/blending techniques here are so beautiful, can be applied in many occasions and with many colours. I have a couple of requests. one of my favourite photographers on deviantart has these works in his gallery and the make up is really cool. more like fun or photoshoot make up. here are the links. You look so beautiful in all those pictures! I love this look, it's gorgeous! Holy smokes! 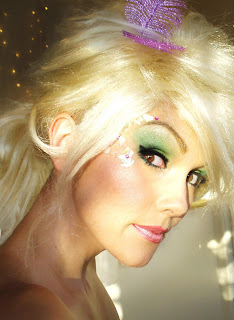 I want to look like Tinkerbell every day. You're the best, Kandee! awww this look is so cute and shimmery! By the way, i just got a flower ring just like yours! i LOVE it! i showed it off on my blog (petitderriere.blogspot.com) and of course mentioned you in the post and had a link to your blog! amazing ... your make-up look exactly like tikerbell. ooh wow ... really amazing!!! i LOVE it!!!! woooooohooooo!!! danke schoun Kandee! 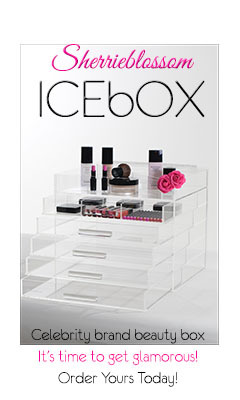 Hey kandee can you PLEASE let me know what lip colors you used? I know you used the Kryolan palette - but can you tell me the particular number? I am dying to find this color!! So adorable! I think your natural eye color is prettier! www.threadbanger.com is good place to find more halloween DIY stuff too! Kandee! I'm going to a a pirate for Halloween and my costume is kind of like a sexier pretty looking pirate and I have no idea what to do for my makeup or hair! HELP! I love your make-up so much! Can you do make-up for a Roman or Greek goddess? CAN YOU PLEASE DO A 1920'S FLAPPER GIRL LOOK NEXT!!!!!!!!!!!! I so second Monica's request!! all your "costume" videos are absolutely fantastic!!! you are my inspiration for my beaty saloon. I owe you soooooooooo much. ever thought of doing a video on a vampiress look? that would be great!!! aww kandee that is absolutely amazing! love it! 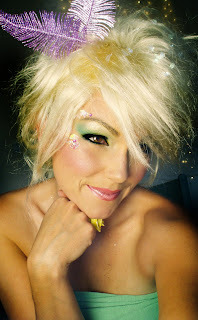 Kandee, could you do a makeup look for Alice in Wonderland. I've been feeling really down and i bought this costume and it makes me feel so pretty and all I need is the makeup look to go with it. Anyway, would you mind doing a video on how you do that side-pony tail look with the pouf-type thing in the front? It's the one in your Sophia Loren Pin-up girl video. You wear it in others, but it's especially good looking in that one. I'm getting a good little selection of hairstyles collected because of your videos (side swept bangs, pomp, pouf) but would L-O-V-E to add that look from that video especially. I've been watching your shirt cutting videos and you've solved a problem for me! See, I took all my boyfriend's ugly shirts that he shouldn't wear, and I cut them and now I have a cute new wardrobe and he can't wear them anymore hahaha! You look awesome with blonde hair! I always look forward to watching your costume series videos... you are so creative!!! i left a comment earlier on YouTube but out of the +1000, i doubt you'll see it...lol. Would you be able to show us a ghostly, scary type of look? Like white face w/sunken eyes? I love watching your videos because you are soooo adorable. Thanks for being so upbeat! gorgeous as usual kandee! you are very very creative, wish i could try out all your ideas for halloween. i LOVE this video U look fantastic! Hi Kandee, I think your great i wish you much more luck for the future in everything you do!! Im thinking of a theme for my 21st in nov i was thinking a 80s theme but im not too sure yet im sure that your videos will inspire me either way!! you should do a pochahontas look!!!! 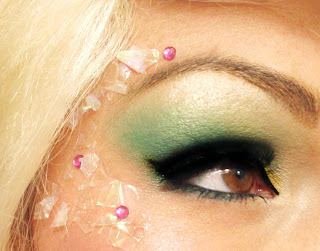 oooo I absolutely love this look, I think I will have to be tinkerbell this year. You are amazing! Love it! I just need a dress up party to go to now! I'm not sure they'd appreciate me looking like this at work haha! Love ALL your looks especially the costume looks for this time of year! 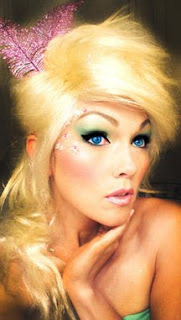 I know you have done a "pin-up" look video, but could you show us an ultra-glam Vargas Girl look for Halloween? I need your help!! Keep the vids coming, girl you have changed my life with makeup!!!! Another amazing look! You always do the best videos and you are so inspirational! You always put a smile on my face! I was wondering if you could do any "dark" looks? Dark fairy, dark angel... and maybe one with the makeup lace technique? Thanks! Love ya! I love, love, love that you are doing all these great characters. You should compile them into a book! They are fantastic!!!! Combine the beauty of nature with the enchanting sounds of moving water with this delightful Bi-level Jug Fountain with Planter. A sleek planter sits atop the fountain center as water bubbles over into the round base beneath. Ideal as a focal point for your garden room; or place outside as a surprise destination along your garden path. * This premium fountain is made of glass fiber reinforced concrete (GFRC) to give the genuine texture and appearance of stone that will outlast traditional cast stone; and at a substantial weight savings. * Shown in the SIERRA finish/color. Click here to see samples of all the finishes for this fountain. NOTE: The Charcoal finish is not available for this fountain. * The Bi-level Jug Fountain with Planter is 50 inches tall; 36 inches in diameter and weighs 440 pounds. * Our fountains provide value pricing; superior craftsmanship; and minimal maintenance. Each includes a UL listed and approved variable speed pump. No plumbing is required; as water recirculates within the fountain. * This fountain plugs into a standard 3-prong household electrical outlet. * The Bi-level Jug Fountain with Planter is made to order; and is a special order item. * Shipping for this fountain is available to any address in the Continental USA. It normally ships from the factory within 4 to 6 weeks of the order date; and will arrive securely packed on a pallet via truck. Each fountain includes assembly instructions.